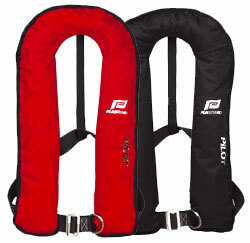 Your lifejacket will give you many years of service, provided it is cared for correctly. Automatic lifejackets should be serviced every year by a qualified agent. Looking after your lifejacket will help preserve it. Many automatic lifejackets operate by a chemical process with water, as such they are prone to inflating if stored incorrectly. Always store in dry conditions, and if wet after use hang upright in a warm place to dry. Never when wet, place straight into storage without drying! Your lifejackets' fabric has protective coatings which can be damaged by proprietory cleaning fluids, thinners, spirits or similar substances. Lifejackets should be cleaned with a good quality mild detergent in cool water. Rinse well with clean water and allow to dry naturally. Sponge off contaminants such as oil or diesel immediately with clean water. be hand tightened only. Never use your lifejacket as a pillow or cushion. 01326 280789 or email us at info@swliferafts.co.uk.